Vibeke Fonnesberg Schmidt handbuilds exclusive one-off lamps in plexiglass and brass with reminiscences of 1960s Italian design, French Art Nouveau and German Bauhaus modernism. With an experienced eye, developed over her long and esteemed practice as a maker and designer, Vibeke Fonnesberg Schmidt creates lamps in a new idiom that stands at the intersection of art, craft and design. The narrative quality of Vibeke Fonnesberg Schmidt’s lamps lies in the potentials of the colours. In their intuitive recognizability and often surprising interplay of geometry, light and material, the designs are exquisite eye candy. 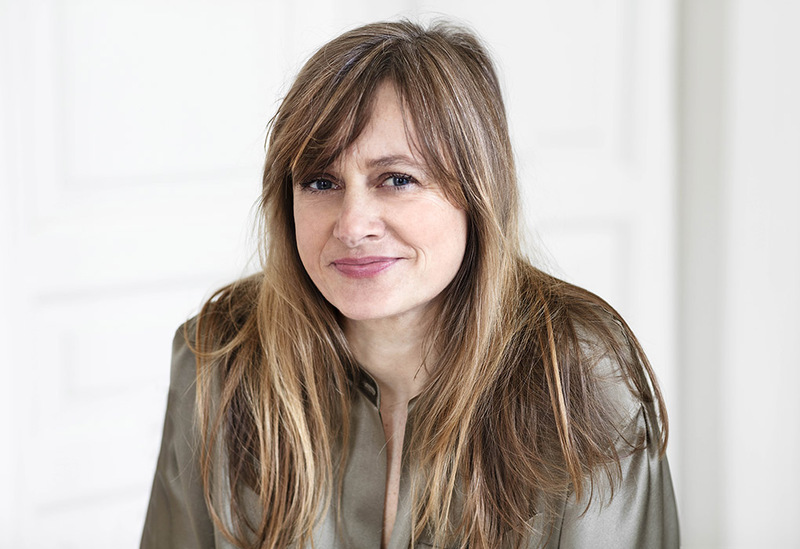 In recent years Vibeke Fonnesberg Schmidt has worked with world-renowned partners, including Nilufar Gallery and Dimore Studio in Milan and leading international interior designers. Partners who see the strength of Vibeke Fonnesberg Schmidt’s handbuilt lamps and their sublime aesthetic friction. Vibeke Fonnesberg Schmidt’s lamps are hybrids of lightness and solidity. Of opal and transparent light effects. Of infinite expressions of light controlled in a nuanced spectrum. The lamps are sculptures – whether on or off – and as such they offer more than the sum of their parts: a profound understanding of form. A disharmonious harmony. A poetic and coherent unity of repetitive, constructive principles and thematic variation. When the lamps are switched on, they generate a new range of nuances and offer a glimpse of the structural frame through the translucent layers. Vibeke Fonnesberg Schmidt’s work is methodical, driven by a system and its inherent possibilities. By the structure. By the repetition and the spatial dimensions and symmetries that are broken down, shifted and displaced to give rise to new constellations. The lamps have a complex sculptural tactility, as the plexiglass elements fold and unfold in a carefully choreographed practice at the intersection of mathematics and art. Vibeke Fonnesberg Schmidt’s lamps are shaped by precise and painstaking craftsmanship and would be impossible without an experienced brazier, a dedicated plexiglass manufacturer and a computer programme, where all the elements are drawn and measured. There are 72 – 86 different discs in the larger chandeliers SETTANTA and Dining Table and between two and four slits in each, all of which have to be fitted and hand-polished. The plexiglass sheets are cast, so they are never quite accurate, and that tiny variation in thickness influences how precisely they fit together. The lamps and chandeliers are constructed of plexiglass in varying degrees of translucency from opaque to transparent. The suspension and construction are made of brass that is allowed to develop a natural patina. The lamps and chandeliers come in a number of standard combinations, but we also offer custom colour combinations. Please contact the studio if you would like more information about colour combinations or have any specific requests. The plexiglass is cast by a Danish manufacturer and cut in Copenhagen. We offer custom colours and translucencies. Please be aware that this will add to the price and delivery time. You are always welcome to contact the studio for more information. The studio welcomes custom projects and works with a skilled brazier to create custom suspensions and other constructive solutions. Vibeke Fonnesberg Schmidt handbuilds her lamps in her studio in central Copenhagen. With the Marble Church, one of the city’s iconic buildings, in clear view and almost within reach, her studio is placed at the top of the five-storey building at no. 1 Frederiksgade. A building that has quickly become one of Copenhagen’s most significant design hubs, where design entrepreneurs, architects and up-and-coming and established Danish design brands have their base, benefiting from the setting’s diversity and synergy. Vibeke Fonnesberg Schmidt graduated from the Royal Danish Academy of Fine Arts, School of Design. She builds on a well-documented career as a recognized craft maker and has exhibited widely in Denmark and abroad. Throughout her work, from porcelain via wood to plexiglass, runs a thread of quality, displacements and minimal but impactful effects. Her artistic perspective is characterized by a genuine interest in geometry and systems – and, more importantly: in dismantling them. Her design of the wooden BAU lamp for Normann Copenhagen clarified her interest in lighting, while plexiglass offered a translucence and a range of colour potentials that gave her greater latitude in controlling the light. The suspension lamps are constructed of circular pieces of birch plywood.The lamps are made in two different constructions. Bau Small and Bau Large are produced by Normann-Copenhagen. They are available in two color versions – Multi and Nature. A seed head in a flowerbed was the source of inspiration for Poly Coat Rack, which is a functional everyday sculpture with seven arms, three of which are attached to the wall. Poly was part of Danish Crafts Collection 17 and is produced by the Danish company Skagerak. It is available in oak. ‘Transformed Geometry’ is about balancing harmony and beauty in geometrical shapes. Disintegrating the severity and rigidity of the porcelain in basic and historical shapes such as the cylinder, the cube and the ellipsoid. The slip-cast porcelain vessels are cut through, and the segments are rejoined to form new, staggered compositions. In the kiln, the porcelain and glaze fuse to recreate the unity of the vessel. In ‘Transformed Geometry’ Vibeke Fonnesberg Schmidt challenges shape and composition, pursuing her ambition of following unanticipated paths of disorder that lead to harmonious surprises and new mash-ups. Every firing holds its own unique surprises, reconciling control and chaos in a balanced aesthetic. A serie of vessels in white porcelain. All the vessels have been cast in the same basic cylindrical form. While the porcelain is still soft and malleable, the form has been reworked in a number of different techniques. Upon the subsequent manipulation of the form, reciprocal contrasts and changing expressions come into being. These range from the voluminous and tense, through the soft, to the sharp and brittle. In this project the important thing was to explore shape. To explore the elements that make up shape: line, angle, surface, mass and space, and to investigate how to create an expression, a sensation, by combining and contrasting these elements. The vessels are hand built in stoneware and covered with a porcelain engobe. They were first shown at the exhibition URBAN at the Design Museum Denmark in 1997. In 1999 the URBAN exhibition was shown at Gallerie Maronie in Kyoto, Japan. YELLOW 1:1 was an art installation created for the Biennial for Crafts and Design 2004 at the Trapholt Art Museum in Kolding, Denmark. It measured 5 x 10 meters and was a three-dimensional pattern consisting of 75 ceramic elements. Later on the installation was exhibited at the restaurant at the Danish Architecture Center in Copenhagen. The Recircle tables were created for the Biennial of Art and Design at Trapholt Art Museum 2009. The theme of the Biennial was sustainability. The tables are made of scrap wood and leftover wood from furniture production.Each table is constructed of four or five circles slit into each other.The tables are decorated with computer designed patterns hand painted with acrylic paints. Once an order has been accepted receipt of a 50% deposit is considered confirmation of the order. Since all of the lights and chandeliers are made to order, the deposit is not refundable. The deposit is paid via bank transfer. The final balance and shipping fees directly to the transport company must be paid before delivery can be scheduled. Please allow up to 5 business days for a bank transfer to clear. We often customize colours and length of suspension stems. We can make the plexiglass in any colour and translucency you request. Please notice that this will add to price and lead time. For bigger custom projects please contact the studio. When a drawing and a design has been accepted by the client, receipt of a 50% nonrefundable deposit is considered confirmation of the order. We are not responsible for any errors client has overlooked after payment has been made. We work with an experienced transport company that can arrange transport all over the world. We can provide a quote from the transport company upon request. Since all our lights and chandeliers are made especially for you, we are not able to offer returns. The lights are designed to be installed into a standard junction box by a certified electrician. We provide installation instructions. Damage claims must include photographs along with a written description of the damage. Vibeke Fonnesberg Schmidt Studio is not responsible for repair or replacement of damages reported after this time. If damage has occurred in shipping, all packaging must be retained by the receiver; failure to do so may invalidate any claim. Any cost of installation or re-installation or repair work. In no event will we be liable for special, incidental, consequential or exemplary damages arising out of this agreement or out of the use of the goods or for services provided by us, including, without limitation, damages or costs relating to the loss of profits, business, goodwill, property damage, or bodily injury, even if we are advised of the possibility of such damages, or for any similar claim against you by another party. The above exclusion of incidental and consequential damages may not be enforceable under some applicable laws, so such exclusion may not apply to you. In no case shall our liability for money damages exceed the invoice amount paid by you.